We are delighted to have secured a special evening screening the highly-anticipated biopic of Elton John, Rocketman, on the night it opens in UK cinemas. Enjoy drinks (wine or soft) and canapes at the newly-refurbished Sanctuary at Derby Cathedral – formerly the Cathedral cafe – before walking the few paces down to QUAD for the viewing. And as always with our red carpet charity evenings, there will be a few surprises along the way. 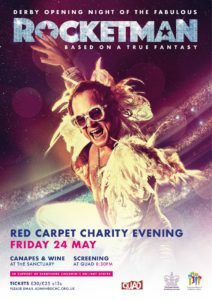 It’s a fantastic opportunity to be the first to see Rocketman, be among the first to experience Sanctuary, and to raise vital funds to help the disadvantaged children of Derbyshire! Tickets are £30 adult, £25 under 13s.